It's satellite time at Juicy Stakes Poker this month with another fantastic trip to the Caribbean on offer to one lucky winner. A trip to the $200,000 guaranteed CPPT IV St Maarten Caribbean Main Event is up for grabs with qualifiers starting from just $2+$0.20. The fantastic package includes the $1650 Main Event buy-in, five nights at the all-inclusive Sonesta Maho Beach Resort in St. Maarten (April 29th to May 4th 2015) and $600 towards travel expenses. Step 1 satellites run daily at 2pm, 4pm and 6pm EST until 21 February, with four tickets into the step 2 qualifiers on offer in each. The $10+$1 step 2 qualifiers take place at 8pm every day with one ticket into the Caribbean CPPT Final to be won in each. The $4,000 package will be awarded in the $100+$10 Final which gets under way at 6pm EST on Sunday 22 February. There's plenty more value on offer at Juicy Stakes this week courtesy of a trio of special freerolls. There's $250 on offer on Tuesday 10 February at 2pm EST (7pm GMT) and at 7pm EST (midnight GMT). A further freeroll follows at 6pm EST (11pm GMT) with another $250 to be won. 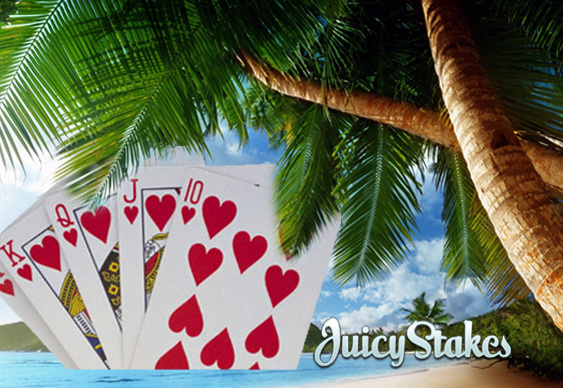 Sign up at Juicy Stakes Poker.